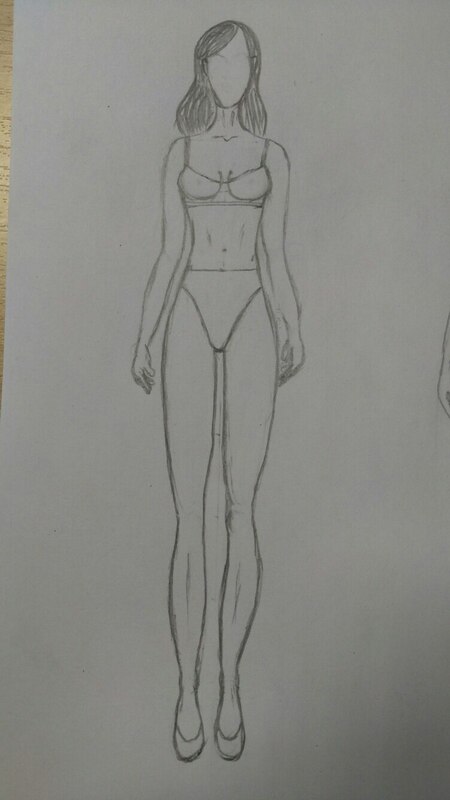 This is a basic class that will teach you how to draw a proportional slim fashion figure. It is going to be a foundation class for other tutorials where the models are drawn in different poses. Mostly we will deal with the main torso and legs. I will show you how to draw fashion figures 8, 9 and 10 heads tall. If you want to learn how to draw head and face, check out this FSketcher sketching tutorial. First of all, fashion sketching is not a part of realism. Of course, fashion figures resemble human beings since in many cases they serve to show clothing on human bodies. However, the proportions of croquis are far from real body proportions. So I find a comment like “real women don’t look like this” addressed to a fashion sketch equal to “this is not a real world” addressed to Salvador Dali’s paintings. Fashion sketch is an ABSTRACTION. Take a look at the image below. These three figures have different proportions and hence give a different impression. The first one is really elongated and looks so “fashionable” and unreal. The third one looks the most natural. However, all three fashion figures have similar mathematics behind them. IMPORTANT Please, check the “HEAD DRAWING TUTORIAL” if you haven’t yet. Usually, we draw head with the dimensions of 2.5 cm x 1.5 cm. I am going to use those numbers in this example. So, the length of the head equals to 2.5 cm (for the third example 2.2 cm). In all three examples, the length of a torso (from the chin to the bottom) equals to 3 heads, e.i. Why do we add 1 cm? Because, on the image, I am using the length of the head with hair. You can add 0.5 cm instead of 1 cm since I always draw quite a long neck. Prepare head drawing (HEAD DRAWING Tutorial). Step 2. Draw two vertical lines for the neck (the width depends on figure type – skinny or athletic?) and two horizontal lines for the shoulders (shoulder width = 4 cm). Step 3. With curved lines show the outline of the body. Step 1. Locate the armpits. There should be enough space to put a small circle between the shoulder angle and armpit hole. Step 2. Count 1 cm down from the jugular notch. Start drawing the lower outline of the breasts. For me, it looks like a tent⛺️ This is just one type of breasts, of course, and shapes and sizes vary. The outer outline looks like S in COSTA coffee logo ? According to our calculation, the length of a torso from the chin to the bottom equals to 8.5 cm. The width of hips is equal to the width of shoulders. In order to draw an hourglass body, draw two intersecting diagonal lines connecting shoulder points with opposite hip points. Outline the body shape as shown in the image. Well, go back to the image with 3 figures and the heads. As you can see, the leg lengths for all three models are equal to 6, 5 and 4 head lengths respectively. All you have to do is to calculate that length. If you divide that length by 2, you will find the knees. In our case it is 15 cm/2= 7.5 cm. Step 1. Count 7.5 cm down from the crotch and locate the knees. Draw them as two closely located circles. Draw the inner outline of the knees as shown below (green). Step 2. On both sides of the crotch slightly higher draw two circles. Connect them with the knees. Step 3. In order to draw the inner muscles of the thighs draw one circle under her crotch and one more circle above her knees (3 and 3′ below). Step 4. Draw the outline of the thighs as shown below. Step 5. Locate the ankles going 7.5 cm down from the knee points. You can draw them as smaller circles. Put them a bit closer to each other than knees. Step 6. Draw the outline of the calves. Pay attention to the shape of the muscles shown above. By “the foot length” we mean the total length from an ankle to the tip of a toe. Step 1. Remember that the inner ankle bone is higher than the outer one. Step 2. Draw the inner outline of the foot. It is steeper than the outer one. In the example, we are drawing feet in high-heels. For flats, the length would be 3/4 of the head length. Step 3. Draw the outer outline of the foot. Step 4. Depending on the shape of the shoe toe, finish drawing the foot. Download FSketcher free fashion drawing templates for all three types of female fashion figures and use them for your projects and as a base for other FSketcher tutorials. This video-tutorial is dedicated to an 8-head tall body rendering. Here, I am using slightly different approach to the figure drawing. Check it out. You might find it more suitable for your drawing style. Beautiful face! Add a bit more distance between her legs just under her crotch; widen a bit the lower part of her feet. Great job ?? Hi. I’ve just found your channel and your an amazing fashion designer. Keep up the great work! ?? Thanks a lot ? ? Thanks for the video. All the best.Cheers. Well, that’s a very good work! ???? I have just some small suggestions. You could make the front of her feet less rounded. Arms still need some work. I’ll add tips on arms to this article next week. You can practice by analyzing photos of real people and trying to draw them. Good luck! ? Thank you!!! This matters so much to me <3 What a pleasure to hear that you are inspired and motivated! Good luck with all your aspirations and goals ? Hello! I’ve been watching your tutorials for a while. I like them very much and these helped me draw something that satisfies me. Thank you!!! I would love to add a drawing of mine but I don’t know how.